This is a German paratroopers mp40 machine gun housing for bolt section well cleaned relic which still has the stamped it for safety .The machine gun part is in relic condition it is rusty with pitting but has a pretty smooth finnish that looks like it has been burnt in a fire and then has been very cleaned it has no paintwork it is perfect for display or any collection.The mp40 part was recovered from German Fallschirmjager soldiers fox holes on Hill 129 part of the battle of St Lo on the Normandy battlefield of July 1944. 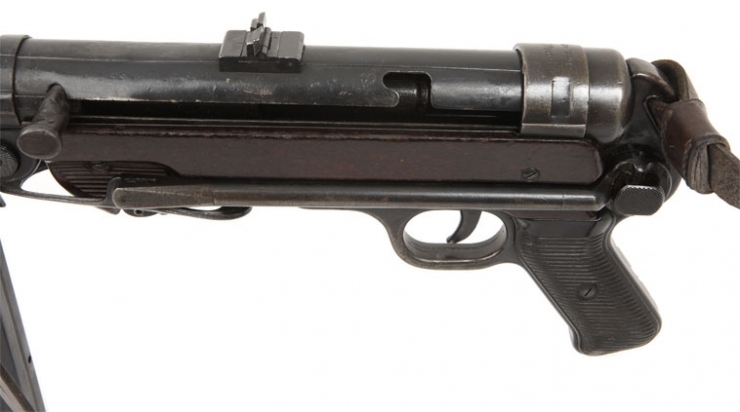 A very nice relic from the famous battlefield and a hard fought battle not that well known today but a fierce battle with the Fallschirmjager that the Americans won. Hill 192 with its overwhelming views on Saint-Lô and the surrounding area, by the 10th July 1944 the Americans reached the bottom of the hill and the roads it overlooked. 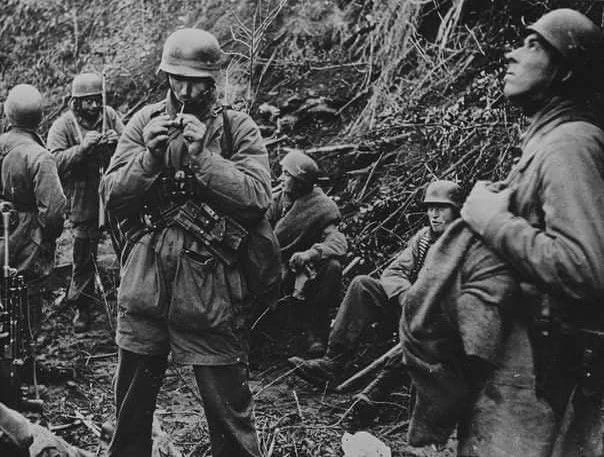 The hill is defended by the paratroopers of the German Fallschirmjäger Regiment 5 and the Fallschirmjäger Regiment 9 part of the 3rd Fallschirmjäger-Division. On July 11, 1944, the assault began the 2nd Infantry Division was to be preceded by a massive air raid at 6 am that morning Company E of the 38th Infantry Regiment (IR) commenced an assault on the western side of Hill 192, followed by the other units of the regiment at 6:30 am with the support of tanks of the 741st Tank Battalion, a company of the 2nd Combat Engineer Battalion and a company of the 81st Chemical Mortar Battalion. During hours of fighting, the Americans are opposed to the fierce resistance by German parachutists who do not retreat and the hamlet of Cloville is quickly nicknamed the “Kraut Corner”. Self-propelled guns and German tanks of the Panzer Lehr Division are engaged in the battle but are silenced by the American 741st Tank Battalion. The American 1st battalion, stormed up the hill at 6.20 am but were stopped on the starting line by German artillery a prelude to how hard the fighting would be to take the hill. The Germans defended the position around the hill and key roads around the hill with formidable combativity and the losses were high on both sides the fighting latest in to the afternoon but finally the Germans, unable to resist any longer, decided to retreat and abandoned Hill 192 to the Americans. They captured it at 1.30pm that day then continued to advance with the heavy fighting carrying on until nightfall by then the Americans had captured the D972 Saint-Lô to Bayeux road and the Germans where in retreat.